The U.S. military relies on special agents to gather information about the plans of its enemies. These agents put their lives on the line to find and bring back this important knowledge. One of these agents is AGENT SCARLETT. She started her counterintelligence work by analyzing evidence, setting up surveillance equipment, and preparing reports. After she proved her abilities in small missions, she began to conduct field operations. Much of her job is finding and verifying information, but that's dangerous work when you're dealing with sources that are part of the evil COBRA organization. On one secret operation, she encountered ZARTAN, a master of disguises who jeopardized the mission by impersonating a G. I. JOE team member. Now AGENT SCARLETT vows to unmask ZARTAN so that he can never endanger anyone again. "People ask me what it takes to be a good agent. I say: integrity, courage, and intelligence." ZARTAN can become anyone by changing his looks, personality, and voice. He's a genius with make-up and disguises and speaks over 20 languages and dialects. He can get in and out of places the size of a shoebox. He was forced to abandon a deadly mission when AGENT SCARLETT saw through his disguise. This was the first time someone had uncovered any of his deceptions, so now he lives to put her away so that she will never unmask him again. A mysterious member of COBRA, he proved his value to the organization by impersonating COBRA COMMANDER then revealing his brilliant deception to the stunned-and impressed-commander. "I can be anyone, anywhere. You will never know that you are talking to me, unless I wish it." 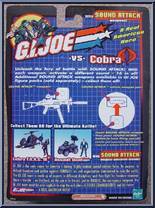 Contribute pictures, update details or suggest corrections for Agent Scarlett vs. Zartan. 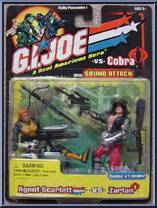 Write a review about Agent Scarlett vs. Zartan.